As October marches on one of my favorite fall activities is quickly approaching. Garlic planting! This is our seventh year with Garlic (Allium sativum) and we're very excited to try some new varieties! I think planting garlic is one of my favorite gardening activities because it's like one last hurrah of planting for an ending season. I like to plant both hardneck and softneck varieties. Even though I try to keep them separated, I always seem to get them mixed together. When they are growing side by side it's easy to tell which is which as they grow. The hardneck varieties will get scapes. I cut the scapes off after they start to curl and saute them in butter, they're so yummy! If you don't cut the scapes off, the bulbs don't grow as big...and I love some big garlic bulbs! But wait....I just skipped way far ahead on you. Lets get back to the planting first! In order to grow garlic, you need to start with a head of garlic. I order organic seed garlic online, but many stores and plant nurseries carry it. I order mine online so I can choose different varieties each year. Locally I only have a few options, though the organic farms near me do have an interesting selection. I've read that some people have luck with grocery store garlic, but it's never worked for me. There's also a possibility that it's been treated with pesticides or a growth inhibitor so if you want to try growing garlic from the store, make sure it is organic! 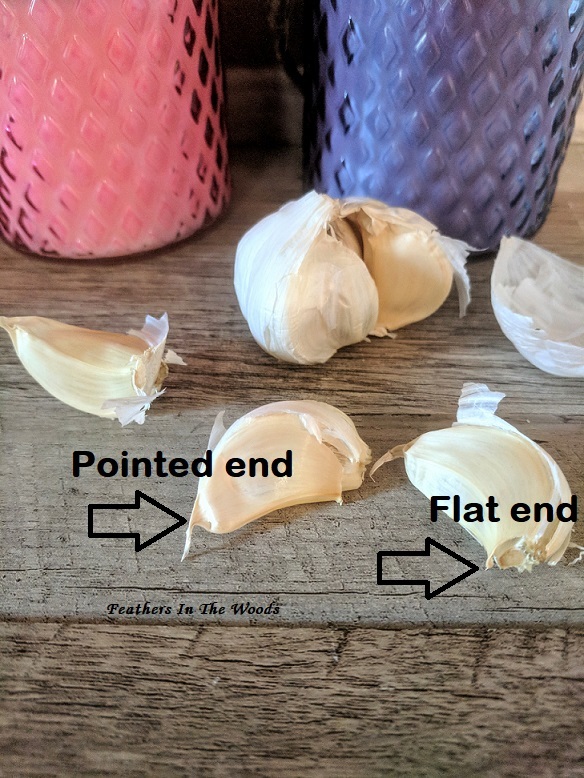 Choose garlic that is firm and not soft or squishy. Garlic gets soft with age and at that point is usually too old to grow. Starting with a head of garlic, separate the cloves removing the papery covering but leaving the thicker skin on each clove. I choose only the biggest cloves to plant. The small ones will grow too, they just tend to produce smaller heads. Plant each one about 3" deep and 6" apart in rows. Make sure the flat part is down, pointy end up. I like to use my dibbler to make the holes. Using a dibbler helps me to measure how deep the cloves are being planted so they're all in uniformly. I learned the hard way that I don't guess real accurately when it comes to planting depth. It's better for me to use some type of tool to measure how deep I'm planting. The dibbler works great, though if you don't want to buy a special tool you can just use a marker to make a line on a stick at the correct depth. After the garlic clove is in the hole, I fill with aged compost and add several inches of mulch. I usually use leaves I chopped up by running them over with the lawnmower. (shhh, don't tell hubby! Why is that such a big deal anyway?) I plant garlic the last week October although some people plant in early spring. If you plant in spring you don't need to mulch as thick. The mulch helps to keep the cloves insulated through the freeze-thaw cycle of winter. When spring hits simply rake up the mulch and you should see tiny garlic plants starting to grow. As I mentioned earlier hardneck varieties will develop scapes and soft neck varieties will not. This will happen when they leaves get to be about knee high. Cut the scapes off once they start to curl. They're so yummy and have a mild garlic flavor. While the soft neck varieties do not get scapes they do have those lovely soft leaves that are easy to weave into a garlic braid. Once the leaves on either variety start to droop down and die it's time to dig up the garlic. I like to dust off the dirt and hang them to dry in the shed. (see picture above) If you decide to braid them you'll want to do it right away since the leaves get brittle when they dry. If you're planning on planting in fall, you'll want to do it around the end of October. It's said that if you wait till spring to plant, the bulbs don't grow as big but I've never tried it. I guess I'll have to try it next year and see!